A few things about this! - It is true that 47% of people paid zero federal income tax last year. It is not true that these people paid zero taxes total. If you earn a wage, you pay payroll taxes. Everyone pays sales taxes. If you own a house, you pay property taxes. (and if you rent, part of your rent goes towards them) Most states have a state income tax. If you have a car, you pay registration fees, etc., etc., etc. Undoubtedly there are some number of people who don't pay any taxes (assuming they qualify for the Earned Income Tax Credit or some other refundable credit), but certainly not 47%. - Fun fact - members of the military earn a lot of their income as tax-free! - The statement that these people "will vote for the president no matter what", is clearly untrue. Taking a random national poll with crosstabs I could find, 43% of those that make less than $30K a year (which I think is a reasonable proxy) said they would vote for Romney. 43% is a lot bigger than 0%. - More generally, people don't not pay any federal income taxes because they don't want to - they don't because they don't make a lot of money. I'm an agog at the logic here. Is he saying that people just don't want to get jobs? With unemployment still above 8%, and four job applicants for every open position, this is just hogwash. And somehow Mitt Romney knows that not only do they not want jobs, but they believe they're entitled to all sorts of things like, um, food. - I don't even understand what he would change about this. Make sure everyone pays some taxes by eliminating things like the standard deduction and the EITC, one of the largest anti-poverty programs the US has? The only thing that makes sense is that he thinks people are choosing not to work because they're lazy and get food stamps. I just don't believe that's true in any sort of significant numbers. - This is what class warfare sounds like, not things like "hey, maybe we should raise taxes on income over $250K or $1M" or something like that. No one (well, OK, not me) is saying that rich people are bad people - we just want them to pay their fair share. Taxes are not punishment. - And, to be a little less fair, Mitt Romney is about the last person I want to talk to me about poor people. What does he know about their struggles? OK! I feel a little better now. Edit: See the followup post on why this isn't a big deal, and the right way to do updating live tiles in Windows 8 Metro. I've been working on porting FlightPredictor to the shininess of Windows 8 Metro. One of the key features of FlightPredictor is the ability to pin a live tile for a flight, and have that live tile update periodically in the background. 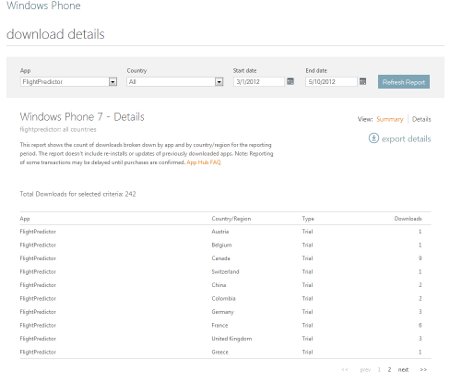 On Windows Phone 7, there are a lot of restrictions on background agents like the one in FlightPredictor that updates the live tiles. 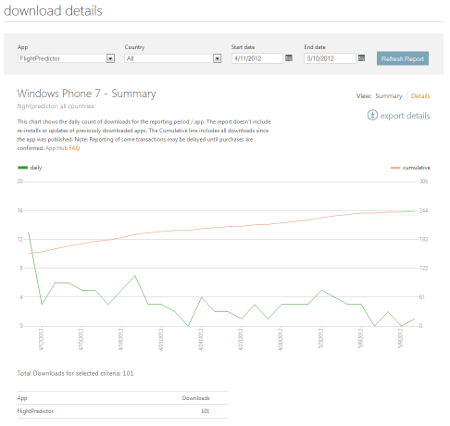 The agent can't run more frequently than every 30 minutes (and when it actually gets called is not that regular), if it runs longer than 25 seconds it gets killed, and most importantly there's a limit to how many you can have active on the phone - Microsoft says phones must allow 6, but my Lumia 900 allows a maximum of 9. I've actually hit this limit, because live tiles that are always up to date are cool. So, I've started to work on this for Windows 8 Metro, and I found this whitepaper about Metro background tasks. There are a bunch of new ways to trigger running tasks (when you have internet access, for example, or when a user logs in), but you can also trigger them every 15 minutes, which is nice. There are also CPU requirements (now they're measured in CPU-seconds instead of wall time that the task runs) as I would expect. Unfortunately, you can't use the TimeTrigger unless you display information on the lock screen. This requires extra user permission, which is OK enough, I guess. I wasn't planning on looking into showing flight info on the lock screen, but if that's necessary for my app to work the way I want it to I'm fine with that. But here's the kicker: a user can only have seven apps show information on the lock screen. And three of these (Mail, Calendar, Messaging) are builtin! So this leaves four slots for apps to run based on a TimeTrigger in the background. Now for the rant-y part: this is crazy. I have a bunch of apps that run in the background on my phone - as I said, having auto-updating live tiles is one of my favorite features of Windows Phone. To drastically cut the number of apps that can do this on an OS that's designed for a tablet (so presumably better battery life, etc. than on a phone) is way too strict and a step backwards. It is possible I've missed something here, and I'd love to hear feedback on it. This is just a policy decision - what I would really like is the ability to run based on a TimeTrigger even if my app isn't on the lock screen, with reasonable limits. 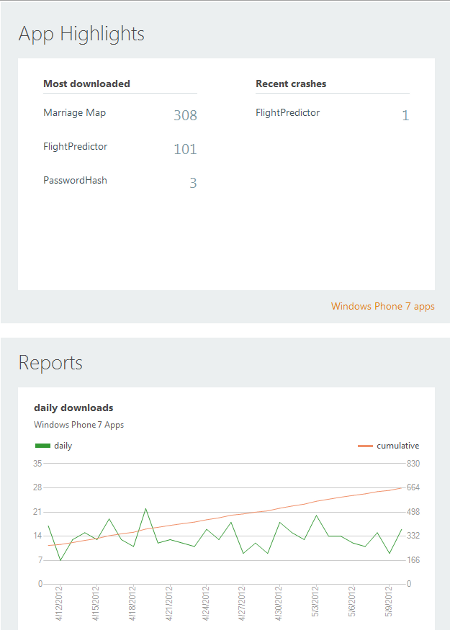 So, here's my plan: try to port FlightPredictor to Android and Windows Phone 7. Hopefully this will lead me toward which platform I'd rather own. Note: I am definitely not abandoning webOS, but I need a new phone and since the Pre3 is only being released in Europe and the European Pre3's will work on AT&T or T-Mobile but won't get 3G service, that's not gonna work. So! First up is Android, mostly because I can develop for it on Linux. But it's not off to a good start. I'm reading through the mounds of documentation and not getting much of anywhere. The very first screen in FlightPredictor shows a list of flights with their status and such. So I need to define a list in the UI and each list item I want to display certain properties of the Flight object. So, I thought a good first step for tonight would be getting something like this to work in Android. First of all, the tutorial for ListView seems to assume that you want the list to take up the whole screen. (I want buttons at the bottom for adding a new flight, etc.) Digging around a little more, I found a page that says how to make the list coexist with other controls, and it says to do so I just make a ListView with id "@android:id/list". This is already a bad sign: what if I (gasp!) want two lists in a screen? - it still doesn't show me how to set values into things in a resource file, which is supposed to be how all non-trivial views are done! Arrrrrrrrgh. Anyway. Not a productive night. I want to stick it out and accomplish something before giving up, because that seems like the right thing to do, right? - The Onion AV Club previews movies coming out this summer and how they compare to Marmaduke. - Bruce Schneier on why there haven't been more terrorist attacks - the short answer is that they're harder than they look to pull off, and not that many people interested in doing them. Which is comforting, I guess. - So there's this bill that would strip people of their citizenship if they have suspected ties to terrorists. First of all, what happens to someone who has no other citizenship or ties? Secondly, the bar seems way too low here - the Secretary of State can deem anyone (as far as I can tell) to have provided material support, no need for a trial or anything. Sheesh. This strikes me as a very strange sort of attitude to adopt. There's no question that Flash is useful and popular, and it has a large and committed user base. There's also no question that it's often convenient to be able to program for different platforms using environments one already knows. And likewise, there's a long history of creating OS stubs or wrappers or other sorts of gizmos to make it possible to run code "alien" to a platform in a fashion that makes it feel more native. But what does it say about the state of programming practice writ large when so many developers believe that their "rights" are trampled because they cannot write programs for a particular device in a particular language? Or that their "freedom" as creators is squelched for the same reason? I wonder if it doesn't amount to an indictment of the state of computational literacy. That is...what? Let's not get confused here - not allowing the Flash plugin to run on the iPhone/iPad is one thing, sure - I may not agree, but there are valid technical reasons, and it would require Apple to do something. DNC/Obama: The No on 1 campaign asked for DNC funds and didn't get any. Obama didn't lift a finger to help - he campaigned for (now-)former Governor Corzine in New Jersey, and even sent out a special email to people on his email list to vote for him. Maine got a generic "go out and vote" email with no indication of what they should vote on. He couldn't even be bothered to tell people to vote No on 1! Andrew Sullivan makes this point as well, more on the DNC not helping No on 1 in the slightest, more on Obama not helping. Honestly, if they're not going to support the things I care about, that puts things in a whole new light. I don't support health-care reform because it would help me (because I doubt much would change for me), and if Obama's not going to lift a finger to support my causes, why should I support his? I will probably lay off giving money to the DNC for a while (or at least until I calm down) and give to candidates that support my values. National Organization for Marriage/the Catholic Church: These were by far the largest contributors to Yes on 1. The Catholic Church gave more than half a million dollars while, at the very same time, closing parishes for lack of funds. NOM gave at least $1.1 million. Maine voters: Seriously, guys? What the hell? Governor Baldacci: Not mad at all - he had a change of heart and signed the gay marriage bill, and encouraged his supporters to vote No on 1. The No on 1 Campaign: Obviously results are what matter, but they seemed to run a good campaign - this was no botched California Proposition 8-type scenario. Hmm, not as profanity-laden as I had thought. Still, I'm mad. On the good news front, Washington's domestic partnerships vote is looking good (they vote by mail so it takes a few days to get final numbers), and Annise Parker (an open lesbian) is in a runoff for Houston mayor. But Maine really stings. We've been trying to get cable/internet set up at the new place for a while now. We scheduled Time Warner to come out February 29 to hook it up, and the contractor guy said that the signal coming into the house was too weak and a supervisor would have to come out and look at it. Last Friday I called Time Warner to see what the deal was (the contractor said someone would call me to schedule an appointment), and luckily the woman was able to schedule an appointment for that day. So someone did come out to the house, did the same stuff as the contractor, and verified that that was indeed the problem. (not sure what the deal was there) He said engineers (I'm an engineer!) would have to work on the problem outside but I didn't need to be there or set up an appointment or anything. So yesterday I call Time Warner to see if they know if the work's been done or when the work will be done, since we're getting awfully close to moving in. Using their nifty callback feature, I get a call 10 minutes later, and the woman said that in fact the last guy hadn't scheduled anything to be done and that someone did need to be at the house. Le sigh. So that's scheduled for Friday along with hot tub stuff. But it's annoying to have to always call after anyone does anything to confirm what they said/actually get the next step of the process to happen. Someone is to blame for this. I called Time Warner, and they said they could come out today to fix the cable (yaaaay!). They said they'd call 30 mins. beforehand and djedi volunteered to wait for them. At 4:30 I get a call on my cell phone, no caller ID, and when I pick up I hear nothing. I let djedi know that that was probably Time Warner and he heads up there while I wait for another call. When he gets there he calls my cell phone and he can't hear me. Calls back again, still no heary. So I call him back on the work phone, and we figure the Time Warner guy must have called, not heard anything, and given up. Craap. So I call Time Warner and after 5 minutes (most of which spent locked in a stupid phone tree...luckily I remembered where I went before to talk to a human ("0" didn't work)) I get a hold of a friendly person and he sends a message to the tech that "I'm" at the house and to call djedi's cell number. Then I call djedi back (on the work phone) to let him know, and we chat for a minute. Then my cell phone rings again so I hang up hurriedly and pick up. It's the tech, but he can't hear me. I rush over to the windows, call him back, still can't hear me. I rush downstairs, get out of the building in the open air. Call him back, still can't hear me. Finally I go back upstairs and call him on the work phone, he can hear me, then pass on the news to djedi. Synopsis: Time Warner kinda good, my cell phone is at least partially and I'm guessing mostly dead, I am extremely angry and irritable. I just got a second email reminding me that if you donate to the United Way now, you're entered to win an 8GB iPhone. Color me unimpressed. Doesn't it seem kinda backwards to entice people to donate money with a prize? Maybe McElroy Translation (who donated the prize) should have just donated the money it cost to buy it - it's not like Apple donated it or anything. Worse yet, this sets up the idea that you're not donating; you're buying a chance at the iPhone. Will you be so eager to donate when there's no possible reward? number of boxes left: 30ish? We're making real progress here - furniture is set up, and we have most of the essentials (toiletries, a sleeping bag to sleep on the bed, computers, TiVo, etc. ), but there are still lots of boxes to unpack. It is starting to feel more like home, though. Pictures will come (as will some sort of party) when the boxes are gone. Allergies have been hitting me hard for the last few days. They come and go seemingly randomly throughout the day. Nose running is bad, although feeling sweaty all over is much worse. The dust with the boxes isn't helping, I'd imagine. We used Bekins for the move. Our stuff got here Wednesday which was really fast, much faster than we had expected. (only a week after they packed and loaded it!) We lost a table lamp along the way, and an alarming number of mugs were broken. The boxes weren't in great shape - a few had been torn open and such, worse than normal wear and tear that I would expect. (and worse than on the move up there) The couch got a little scratched up (how did this happen when it was wrapped in tape? ), the desks are a little more flimsy (the entertainment center, which we're getting rid of, borders on dangerous), and the washer was apparently resting on the washer hoses because they're both bent out of shape and don't seal. Maybe this is more in line with a "normal" experience...it's just that on the move up (with the same company), everything seemed in the same condition that we left it in. Oh well. djedi shipped his car with Dependable Auto Shippers and arrived quickly, without scratches, and they were even washing it when we pulled up! We think rush hour is a misleading term. Now, ads are dumb, but this seems to reach a whole new level of dumb. It took me a minute to realize the first line was unrelated to anything Time Warner. (is "rush hour" supposed to be some sort of internet thing?) But after that, I'm supposed to think of Time Warner as all buddy-buddy with me? Which cable company would you prefer to have a beer with? The cable company is not a person. If they want to have an ad campaign saying they "focus on customer service" or they "embrace new technology", at least you can pretend that that idea started somewhere real and the marketing is just reflecting that. Or their ads could be based on their product, like "now with 33% more downloading speed than the leading internet provider! ", and even if it's not true at least you can imagine that it might be true. I can't imagine anything - anything done for real that could cause this ad campaign to be true. Looking at wethinklikeyouthink.com (what would a stupid ad campaign be with a stupid website? ), the gist seems to be they have products that you might like. Or maybe there's a more subtle point, but I can't be bothered to take the time to watch all the stupid movies and demos.